Events are underway in Western Europe that will ultimately lead to a dramatic about-face in world affairs. THE PROTECTORS have become the prey. American military personnel are now prime targets for terrorists In Western Europe. In September an ambush set by members of the Red Army Faction in, West Germany nearly took the life" of General Frederick Kroesen Jr., commander of U.S. ground forces in Europe. The attack on the general's car was the 10th assault this year on American military installations in Germany. It represented a definite escalation in terrorist tactics. Instead of employing a secret trip wire to set off a hidden explosive, the terrorists boldly blasted the general's armored sedan by means of a Soviet-bloc grenade launcher. The ambush near Heidelberg occurred just days after 30,000 demonstrators — communists, 'homosexuals and leather-jacketed anarchists — " welcomed" U.S. Secretary of State Alexander M. Haig, Jr. to West Berlin. "Hang the vulture, hang him higher," demanded one placard. Others displayed an American flag shaped like a pig. One thousand anarchists broke ranks to insanely chop up store fronts and automobiles with axes. Both the attack on General Kroesen and the wild demonstration in West Berlin were soundly condemned by West German politicians as well as journalists. Still, there is no doubt that the phenomenon of neutralism and pacifism steadily spreading over West Germany, as well as the Low Countries, has emboldened the extreme radical fringe. In Western Europe, the United States is being squeezed into an almost untenable position. Growing pressure from the political left-evidenced by recent mass demonstrations in several European cities — just might not permit the planned modernization of NATO's European-based nuclear weapons, now scheduled for 1983. This plan calls for the stationing of 572 long-range Pershing II missiles and land-based cruise' missiles in "Europe. For the first time the Soviet heartland would be vulnerable from West European soil, thus offsetting Soviet SS-20 Missiles targeted on European cities. Soviet propaganda against the missiles as well as the announced U.S. intention to go ahead with the neutron bomb has been intense. Various "peace groups" in Europe are calling for scrapping the NATO plan. Beyond politics, however, there is the genuine fear expressed among many West Germans that the newer NATO weapons would only ensure that their country would become the prime target of nuclear attack from both directions. Schlachtfeld Deutschland they call it — Germany as battlefield. According to this view the attempt to restore the balance is the problem: It might "provoke" the Kremlin to further aggressive action — eventually perhaps even a preemptive first strike. At the same time, concern over the drift of events is rising among influential powers-that-be in politics, banking and industry in Western Europe. What these men — "the elders" referred to by Mr. Joffe — see is hardly reassuring to continued peace and prosperity, for Europe. This conservative element is fearful that Mr. Reagan will now be unable to close the so-called "window of vulnerability." This is that time in the middle to late 1980s when the United States is expected to suffer from a serious gap in strategic balance with the Soviet Union. During this period, the Soviets, should they choose to do so, could possibly succeed in launching a nuclear first strike against U.S. forces without fear of nation-destroying retaliation. Should this gap occur, coupled with a delay in deploying NATO's new generation of weapons in Western Europe — a likely possibility — all of Western Europe would be extremely vulnerable to Soviet "do it our way or else" pressure. "Finlandization" — that process whereby Western Europe's freedom would be inevitably compromised to dictates from Moscow — would no longer be a clumsy phrase but a grim fact. Out of sheer fear the majority of Western Europeans might choose "Red" over "dead." European civilization as we know it would be slowly strangled to death. There are powerful individuals in the topmost echelons of European politics, finance and industry who see the big picture and who are greatly alarmed at the prospect of Finlandization. Free Europe's phenomenal economic success in the post World War II period is squarely on the line — and these power brokers know it. In their view, if the United States can no longer be relied upon to provide protection, then the answer is simple — someone else will have to do it! The key nation to watch in Europe therefore, as the dangerous decade of the 1980s unfolds, is West Germany. Trends in the Federal Republic often trail those in the U.S. by several years. The U.S. swung sharply to the right in the November, 1980, national elections. Germany, meanwhile, in its own parliamentary elections a month earlier, stayed to the left. The electoral challenge of conservative candidate Franz Josef Strauss was turned back. The average German voter feared to let loose of incumbent chancellor Helmut Schmidt, who had maintained Bonn's booming economy in high gear. Since that time, Bonn's sudden economic downturn coupled with rising problems with neutralism and terrorism have made Mr. Strauss's clear warnings concerning these very trends plausible, instead of mere scare tactics. "I believe the attractiveness of socialistic slogans, of Utopian models and inflated promises, has come to an end.... We must not confine our political programming to promises of more welfare and ever rising living standards. We must rekindle the real values of life in young people, and restore a sense of history and historical responsibility. Material — is not enough." "Materialism is not enough" maintains Mr. Strauss. Rekindling a "sense of history" is needed. This will be difficult with a modern generation, drugged as it were, on prosperity and deceived by the illusions of detente. But as the threat to Europe's very existence intensifies, there will surely come calls for Germany to fulfill once again its historic role as a bulwark of Christian civilization against the atheistic challenge from the East. Time is short. For each week that passes, one new SS-20 is added to the Soviet arsenal. The preferred answer, says Mr. Strauss in the Now! magazine interview, is to "restore the validity of the American security guarantee for Europe by deploying medium-range ballistic missiles in Europe itself." It is absurd, Bavaria's minister — president claims, to expect Americans to deter the Russian SS-20s targeted on Europe by threatening to use their intercontinental strategic weapons alone. In that case, says Mr. Strauss, the Americans risk a destruction of their own country, "so that the Europeans become hostages and the Americans are paralyzed." One gets the distinct impression that if America can't provide this "adequate counterforce," then Europe, or at least Germany, must do it — somehow, some way! Advanced nuclear technology is present nearly everywhere in Europe. Warheads already exist — in the possession of the French and British nuclear forces. All that is lacking — which is considerable — is access to sophisticated delivery systems, such as cruise missiles. The dim outline of Europe's destined future is becoming clear. 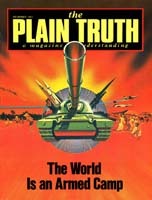 For decades — even before the conclusion of the Second World War — the editors of The Plain Truth have announced to readers that, based upon history and biblical prophecy — specifically the 13th and 17th chapters of Revelation (coupled with the book of Daniel, chapters 2 and 7) — there would eventually arise a powerful "third force" in Europe, one last reconstitution, in modern form, of the ancient Roman Empire. For the past three decades the nations of free Europe have inch by inch coalesced into a common economic bloc. But the impetus to go beyond economics to political union has ground to a halt, crippled by national jealousies and suspicions. The final union of Europe will more likely be forged out of fear that Europe's near two-millennia-old Roman Catholic-based culture is about to be trampled under the heels of atheistic Soviet "scientific socialism." As Flora Lewis, diplomatic correspondent for the New York Times puts it: "Europe may save itself by sheer fright when it actually looks over the precipice it has been approaching for years." When — not if — Europe gets its own independent nuclear strike force, its future leaders will be able at last to neutralize the threat from the East. A deal might be struck to move back the Iron Curtain to Soviet borders in exchange for agreeing to respective "spheres of influence." These spheres of influence could extend even into the Middle East (Dan. 11:41-44). In Europe itself, a "deal" would undoubtedly involve the breakup of NATO and the breakup of NATO forced removal of American forces from Europe — in exchange for a withdrawal of Red Army forces to behind the Soviet border. The way would be open not only to reunite Germany, but to free Russia's troublesome East European satellites. A new Europe would arise out of East, West and Central Europe. The great image of Daniel 2 not only has "10 toes," but of course stands upon two feet. The coming 10-nation union might very well consist of five nations or groups of nations from Western Europe (possibly considering the Benelux countries as one entity) plus five nations from Eastern Europe. The ancient Roman Empire, one must recall, was itself divided between east and west. Moscow's obsession is with security. It might be willing — or be forced — in the future to trade her buffer zone in the East for promises of nonaggression and massive assistance for her stagnant economy. "Tubal" and "Meshech" referring. to the Russians in prophecy — are pictured as heavily involved in the final worldwide trading combine centered in Europe (Ezek. 27:12). In this grand realignment, the United States, Britain and some other North Atlantic countries would be left out in the cold — exposed to mortal danger! "To the Borders of Russia"
Otto von Habsburg represents a section of Bavaria in the European Parliament. Dr. von Habsburg, a close friend of Dr. Strauss, is the son of the last Austro-Hungarian emperor. The Habsburg dynasty played a major role in the leadership of the resurrected Roman Empire from the late Middle Ages well into modern times. In an interview not long ago with the weekly West German newsmagazine Der Spiegel, Dr. von Habsburg was asked, "Where, then, does your Europe end?" Dr. von Habsburg answered: "It extends to the borders of Russia." To the question, "Does that mean that you intend to expel the Soviets from Eastern Europe?" Dr. von Habsburg replied: "That means that we have a feeling of solidarity for the Europeans on the other side of the Yalta line, that we have to stand up for the right of self-determination of these Europeans with all peaceful means. It is for us an unbearable thought that decolonization is applicable exclusively for Africa and Asia and not also for Europe." In an interview some years earlier, Dr. von Habsburg asserted: "Right now politically the only thing one can do in the West is to see to it that the West be united as fast as possible... in order to give all those nations [in Eastern Europe] who are now separated from Europe an alternative when the time comes — God knows when it's going to come, but it will come one day." Religion — part of Europe's historic past that today's youth overlooks — is critical to its future. Dr. von Habsburg regards Christianity — in the form of the Roman Catholic Church — as Europe's ultimate bulwark. "The cross doesn't need Europe," he says, "but Europe needs the cross." Thus the stage is being set for that final, dramatic revival of the Roman Empire. When it actually occurs it will shock an unexpecting world (Rev. 17:8) — all peoples except those few who understand Bible prophecy and God's Plan, and who are called in this age to be in spiritual training for the World Tomorrow. The good news is from that date onward it will be but a short step in time to that happy World Tomorrow when Jesus Christ will return the second time and the government of God and world peace will be restored to this earth.